Beginning from September 2018, SPACES FOR CHANGE (S4C) has been conducting an independent evaluation of the National Home-grown School Feeding Programme (NHGSFP), to improve transparency in the management and performance of the initiative in Imo and Abia States. 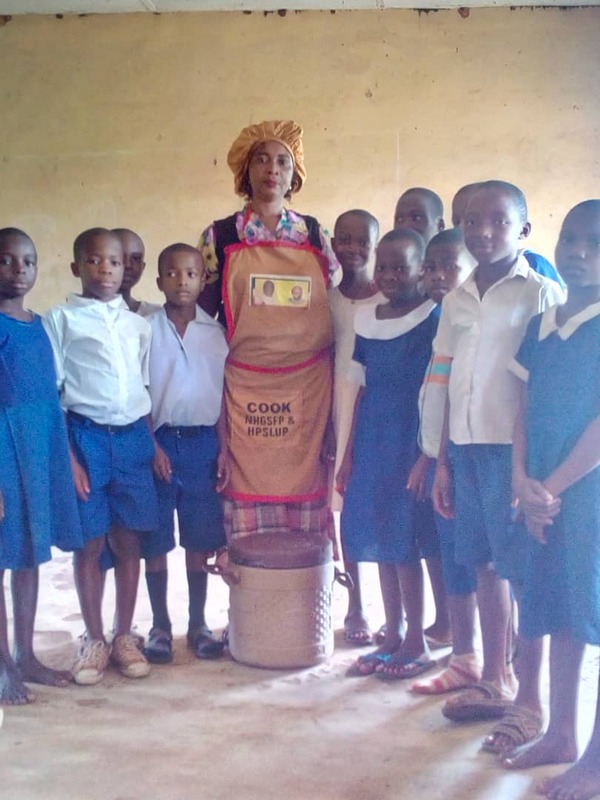 With about 10.5 million out-of-school children across Nigeria, the NHGSFP was introduced in 2016, to provide one hot meal every school day to pupils of public primary school pupils in Nigeria, with a view toward boosting primary school enrollment, attendance and completion rates in the country. By sourcing food from farm produce locally-grown by smallholder farmers, the school feeding programme further aims to create employment and bolster the production of home-grown foods. The objective of this independent evaluation, generously supported by Trust Africa, is to assess the extent the project is realizing its intended objectives, and use evidence-based research information to provide feedback to support the continuous improvement of HGSFP’s practices and results in the country. The evaluation began with a scoping study aimed at understanding the operational and institutional arrangements for program implementation. During the scoping phase, S4C consulted and directly engaged the coordinators and institutions coordinating the feeding programme in the two states. Through these consultative meetings, S4C gathered useful information regarding the operational frameworks, financing mechanisms, food sourcing and distribution arrangements and school enrollment records in both states. Armed with the data generated from the desk research and consultations with state actors, S4C developed instruments to guide robust information-gathering on the field from a variety of stakeholders involved in the implementation of the HGSFP programme at the local and state levels. The instruments, modeled after the data collection instrument for school feeding, developed by the World Bank and Human Development Network, framed a set of research variables to determine to what extent the programme is influencing school enrollment, attendance and completion rates. Other indicators assessed include student well-being, boy-to-girl ratio in school enrollment and completion rates, monitoring and evaluation mechanisms per state, nutritional quality control, food quantity and satisfaction ratio, meal preferences, health benefits, community participation in the HGSFP, local agricultural production and contribution, food hygiene, availability of complaints and accountability procedures etc. To achieve the set targets above, different data collection instruments were developed for pupils, head-teachers of participating schools, parents of the pupils, and for food vendors. Reaching non-pupil respondents became necessary in order to close the information gap from the field survey data, using a number of post-survey techniques such as interviews and focus group discussions with key participants in the scheme such as school principals, teachers, food vendors, and parents of the school pupils. The functionality and relevance of the instruments were tested at a pilot survey conducted on October 10-11, 2018, in Owerri, Imo State. Through the pilot activity, S4C gathered some useful information that will guide the conduct of the main survey. It also evoked a lot of feedback regarding the survey questions, resulting in the reframing of a number of questions to increase adequacy and comprehension for pupils, parents, food vendors, local residents / natives of the community etc. Field and household surveys were conducted in Abia State between November 4 – 11, 2018 and in Imo State between November 12 – 19, 2018. For over 14 days on the field, 10 trained enumerators assisted project staff in data collection on the field in the two states. In Abia, S4C administered questionnaires in 3,357 pupils in 42 government-run primary schools across the entire state. 20 head and assistant-head teachers of public primary schools, 492 parents of pupils in public primary schools and 17 female food vendors were interviewed in different parts of the state. Field visits were conducted to 3 locations where food was cooked for pupils and 2 poultry farm that supplied agro produce to food vendors. In Imo, S4C administered questionnaires on 4, 958 pupils in 46 primary schools across the entire state. Through key-informant interviews and focus group discussions, 35 head teachers of primary schools, 177 parents of pupils in public primary schools and 26 female food vendors were interviewed in different parts of the state. Field visits were conducted to 3 locations where food was cooked for pupils and 1 poultry farm that supplied agro produce to food vendors. Overall, 8, 315 pupils, 669 parents, 88 public primary schools in urban and rural areas, 55 head and assistant-head teachers and 43 female food vendors were reached directly during the survey, totaling 9,082 persons engaged towards the process of improving public understanding and transparency in the management of recovered assets through evaluation of the Homegrown School Feeding (HSF) program. Preliminary findings establish that out of the N6 trillion 2016 budget, N500 billion was earmarked for a number of Social Investment Programmes (SIP). Out of this 500m, N93.1 billion was set aside for the school feeding programme in different states of the federation. The coordination of the school feeding programme in about 1279 primary schools in Imo State is vested on Imo State Ministry of Happiness and Purpose Fulfillment, headed by the sister to Imo State Governor, while the Office of the Wife of Abia State Governor (Abia State, Mrs Nkechi Caroline Ikpeazu) coordinates the school feeding programme in over 800 primary schools in Abia. The office of the Vice President retains overall supervisory responsibility for the program. 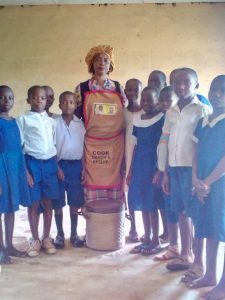 The initiative started off in July 2015 as Abia Primary School Lunch Program (APSLP), then designed to ensure children from poor rural areas had access to one balanced meal daily. 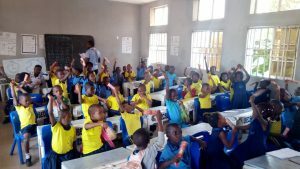 The additional funding intervention from the federal government in May 2017 enabled the state to feed more pupils in primary one to six, with FG funding Primary 1-3 while the State government provides counterpart funding for Primary 4-6. There is no provision for the state’s counterpart funding in Imo. As such, the program only covers pupils in primary 1-3 in the state. The criteria and procedure for the recruitment of vendors is unclear, but for the fund disbursement, the Federal Government, through the office of the Vice President remits money directly into the accounts of food vendors. Reports indicate that the pupils are fed at a cost of 0.19 dollars per child per day, for 9,300,892 million pupils in 49,837 public primary schools in 26 states across Nigeria. Over $183 million has been invested so far. The monitoring and evaluation mechanism for the program includes the appointment of desk officers in every local government area. The desk officers also monitor the kitchens where the meals are prepared in designated areas/ clusters. The two states’ ministries of education are not significantly involved in program design, implementation and monitoring of the program. While many school children approve of the school feeding program in both States, some however, complained about the menu and the quantity of food served to them. For these children, meals can be improved in quality, quantity and diversity. For instance, many school children complained of being underfed as food rations are too small. Other times, the menu lacked some of the meals they would love to eat, especially protein: meat, fish or chicken. Enumerators noticed across all local governments visited in Abia State that most school children do not like potatoes. A lot of pupils complained about purging after eating potatoes. A particular vendor in one of the schools surveyed admitted that she started frying her potatoes after she noticed pupils hardly eat cooked potato porridge. Asides that, school children across both states desire to eat other kinds of food and protein not on the menu especially, noodles, spaghetti, beef, fish, bread and tea. On other hand, many parents in Abia State, especially in the rural areas acknowledged they experienced financial savings as a result of the scheme. Some mothers stated they now spend less on lunch and snacks, thereby saving money for the household. Other parents stated they would prefer free tuition to free feeding. Some others wanted better infrastructure in the schools such as chairs, tables, book supplies, uniforms, and better remuneration for teachers as against free feeding for their children. Head-teachers and teachers had different sets of concerns such as lack of involvement in the initiative and exclusion of teachers from eating the meals. ‘Vendors receive instructions and payments directly from Abuja. We have no role to play’, a head teacher complained. S4C is now working in collaboration with a data mining firm to transcribe, sort, filter and codify data, using statistical packages such as SPSS datasets for entering, sorting and comparison of data, or sets of data, to ensure accuracy and precision. Through the desk study, the pilot and main surveys conducted under this project, S4C aims to generate accurate evidence of program performance and impact on target groups. Accurate data is not only critical to improve the implementation of the school feeding program, but also, through these interventions, better informed pupils, parents, schools, vendors, communities have gained greater awareness and capacity to report gaps noticed and advocate for future improvements.